The Dead Sea is a mysterious looking salt lake which is also known as the Salt Sea. It is one of the most salty lakes with a salt concentration of 33.7%. Due to this high salt concentration people can easily float in the lake. At 430.5 meters below sea level it is the lowest point on Earth. It is located in the Jordan Rift Valley and its main tributary is the Jordan River. It is also the world’s deepest salt water lake to exist on earth with a depth of 306 meters. At its widest point the lake is 15 kilometers wide and its total length is 50 kilometers. The water of Dead Sea is known to treat various skin conditions like acne, psoriasis etc. due to its unique mineral composition. The water can be used for bathing and spa purposes only as the water is not safe for human consumption. The water of the lake is 8.6 times saltier than the Ocean’s water. The mud here is also great for your skin as it has healing powers. The area is also one of the world’s first health resorts. The lake is divided in two parts which are the Northern Part and the Southern Part. The area has become a major center for health research and treatment. The salt of the Dead Sea is not like our regular table salt. It is very much bitter in taste. The discharge of asphalt is an unusual feature of the area as it constantly spits up small pebbles of black substance. The deepest point in the area is known as the Great Rift Valley. Highway 90 is the world’s lowest road which runs along the Israeli and West Bank shores of this lake. Declan, Tobin. " Fun Facts about Dead Sea for Kids ." Easy Science for Kids, Apr 2019. Web. 26 Apr 2019. 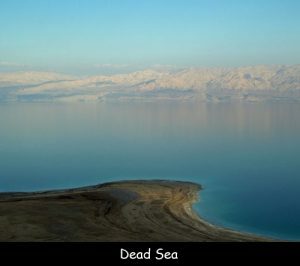 < https://easyscienceforkids.com/dead-sea/ >.